Oct. 7, 2001 - U.S. and British forces begin airstrikes in Afghanistan after the Taliban refuse to hand over al Qaeda leader Osama bin Laden, blamed for the 9/11 attacks. Nov. 13, 2001 - Taliban fighters abandon Kabul after weeks of air assaults. About 1,300 U.S. troops were involved in the offensive. Dec. 7, 2001 - Taliban stronghold Kandahar falls. Bin Laden and Taliban leader Mullah Mohammed Omar escape. June 13, 2002 - Hamid Karzai is elected as head of state of a new interim government by the loya jirga, or grand council. August 2003 - NATO deploys troops to Kabul for a peacekeeping mission. The force later expands to other areas and numbers 11,000. The U.S. has more than 10,000 troops in Afghanistan. Jan. 4, 2004 - Council of elders ratifies a new constitution, making Afghanistan an Islamic state with a strong president. Oct. 9, 2004 - Karzai wins Afghanistan's first presidential election. September 2008 - Extremist attacks have made this the most violent year since the 2001 U.S.-led invasion began, with at least 120 U.S. troop deaths and 104 from other NATO nations. There are now 31,000 U.S. troops in Afghanistan. 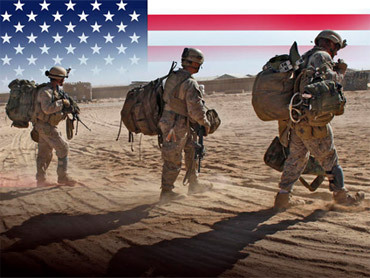 Jan. 30, 2009 - Shortly after President Barack Obama's inauguration, there are 36,000 U.S. troops in Afghanistan. NATO forces total 32,000. Feb. 17, 2009 - Obama approves adding some 17,000 U.S. troops in Afghanistan. May 11, 2009 - Top U.S. general in Afghanistan, Gen. David McKiernan, is replaced as Obama tries to turn around the stalemated war. June 9, 2009 - First deployment of Marines moves into Afghanistan; by June 9, more than 10,000 are in place to ramp up operations against the Taliban. Sept. 21, 2009 - Gen. Stanley McChrystal, the top U.S. and NATO commander in Afghanistan, says in a confidential report that without additional forces, the war against insurgents will end in failure. Oct. 20, 2009 - Karzai bows to intense U.S. pressure and agrees to a runoff election, acknowledging he fell short of a majority after U.N.-backed auditors stripped him of nearly a third of his votes. Two weeks later his challenger drops out of the race, and Karzai is declared the winner. October 2009 - October becomes the deadliest month with 58 U.S. troops killed. Officials expect Obama to make a decision soon to deploy 32,000 to 35,000 more U.S. forces. Dec. 1, 2009 - In a speech from the U.S. Military Academy at West Point, Obama outlines his decision to rapidly expand the U.S. role in the war in Afghanistan. The Associated Press reports ahead of the speech that Obama will send an additional 30,000 troops. About 71,000 U.S. troops are currently in Afghanistan. At least 849 U.S. troops have been killed so far in the war. Obama Speech Is First "Address to the Nation"
© 2009 CBS Interactive Inc. All Rights Reserved. This material may not be published, broadcast, rewritten, or redistributed. The Associated Press contributed to this report.